Hi guys! 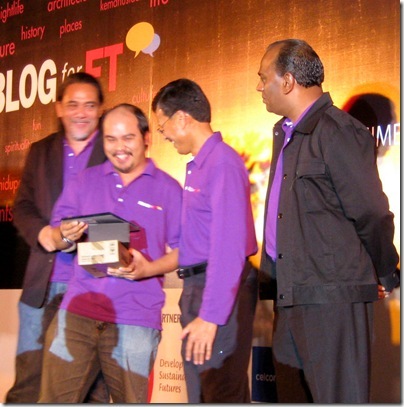 I am glad to announce that I am the 1st runner-up in the Blog4FT (Federal Territories) contest! 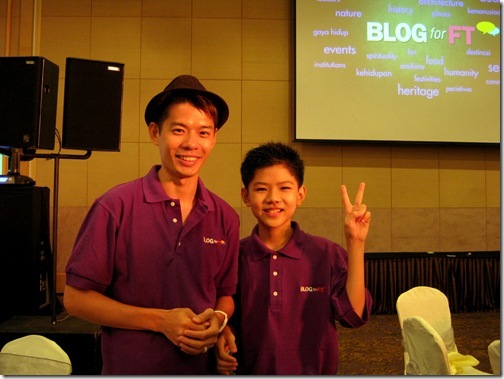 Blog4FT is a blogging contest in which you are to blog about the Federal Territories of Malaysia (Kuala Lumpur, Putrajaya, or Labuan). The main goal of this contest is to make a positive impact about the Federal Territories on the web. 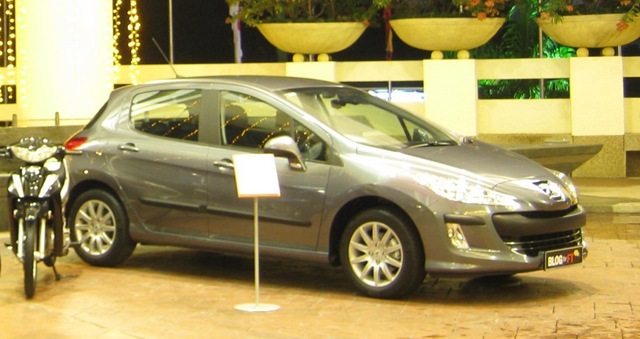 It ran for 3 months (October 5, 2009 – January 5, 2010). Each month, several entries from each category (Public, Media, and Junior) are shortlisted for the final prize. 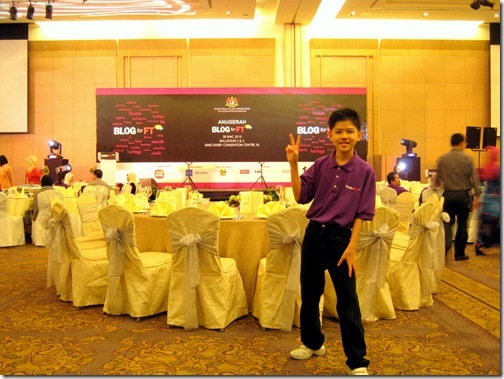 I posted my contest entry, My Most Enjoyable Holiday in KL in Dec 09, in the last month of the competition. It’s about my enjoyable journey through Kuala Lumpur, the exciting capital of Malaysia. The Blog4FT Prize-giving ceremony was on March 28, 2010. All the monthly winners were invited to the ceremony. Me in the Blog4FT T-shirt posing at the ballroom behind the VVIP table before it started. 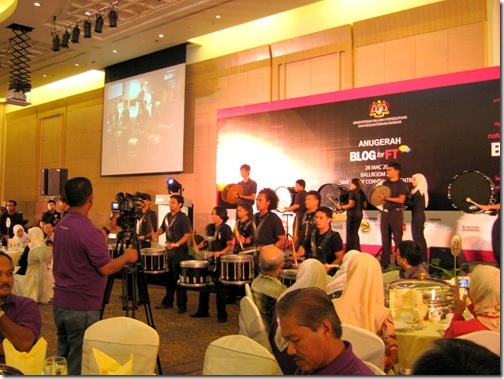 When Datuk Raja Nong Chik, the Minister of Federal Territories and Urban-wellbeing entered the ballroom, a drum band performed to welcome him. Their rhythmic performance was totally awesome! 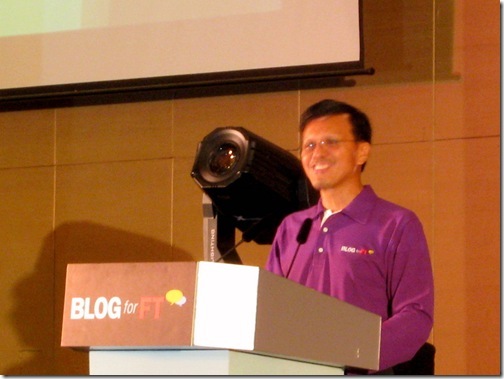 Datuk Raja Nong Chik made his speech about Blog4FT. He said the web is making a big impact on the lives of Malaysians, which was one of the reasons he started Blog4FT. He also said he has a ‘facebook hour’, in which he interacts with comments, complaints and 50suggestions on facebook. He is really one of the first ministers who uses social media to listen to people! Then, dinner was served, and all of us enjoyed the delicious menu. After that was the time everyone had been waiting for – the prize-giving part! The winners of the Junior category were announced first. 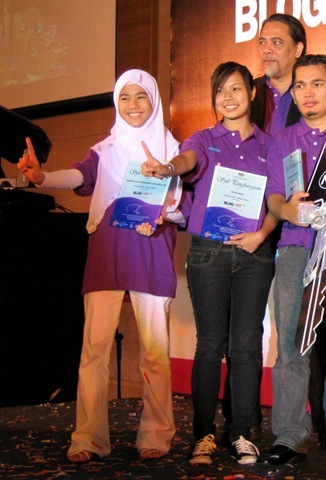 Sharifah Hani was the 2nd runner-up (3rd), for her entry, Kuala Lumpur: The Lost Art of The “Serunai Burung”. 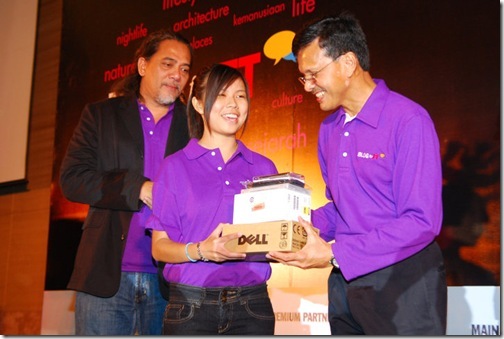 She won a Dell Studio Hybrid and an iPod touch. Congratulations! 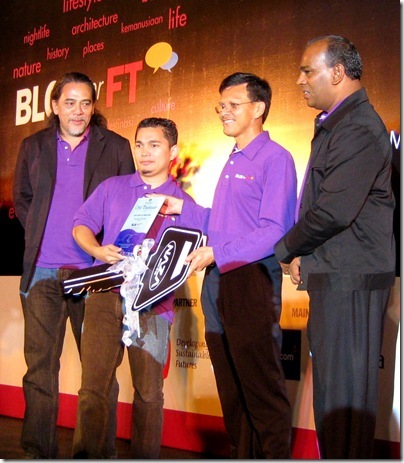 And to my excitement, Gloson (me) was the 1st runner-up (2nd) for my entry, My Most Enjoyable Holiday in KL in Dec 09! 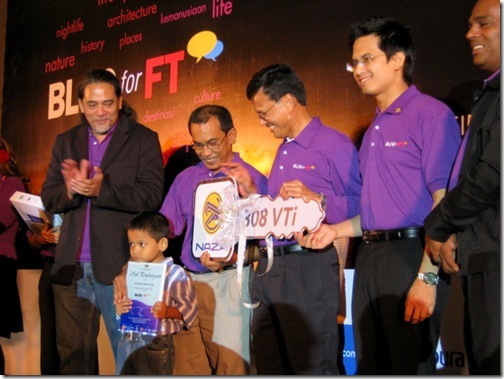 I ran up to the stage and received the prizes and the medal from Datuk Raja Nong Chik, the Minister of Federal Territories and Urban-wellbeing. I won a Dell Studio Hybrid, an iPod touch, and a Sony PSP. I am very thankful to you readers, for voting for my entry and supporting me! Another photo . 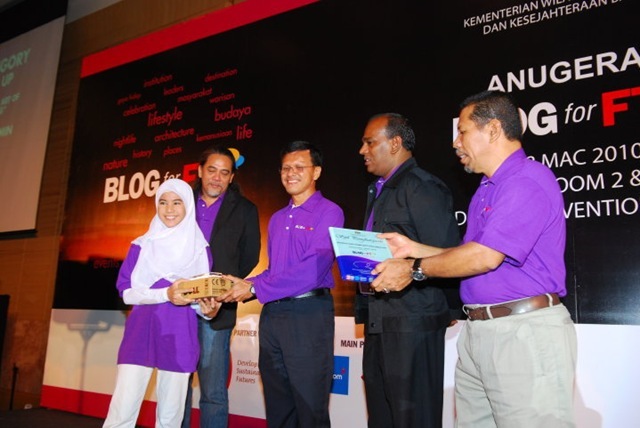 On the left, beside me, is Datuk Ahirudin Atan [a.k.a. Rocky], the Chief Judge of the contest. Yeow Minyi was announced the Grand Prize Winner (1st), for her entry, 350! 350! I SAY 350!!!! She won a Dell Studio Hybrid, a Sony PlayStation 3, a Sony PSP, and an iPod Touch! Wow! Congratulations! The winners from the Junior Category. Then the winners from the Media category were announced. Azizul Fahmi Ahmad Zabidi was the 2nd runner-up for his entry, Cerita kemasyhuran Bangunan Sultan Abdul Samad. 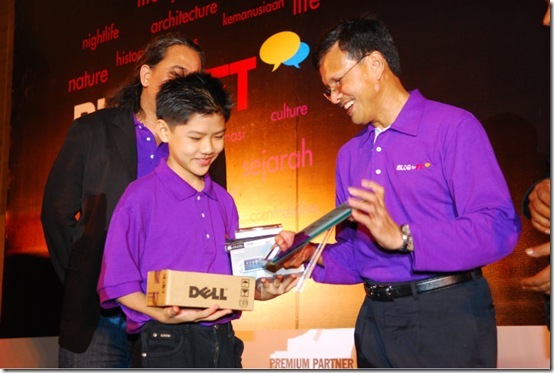 He won a Dell Studio Hybrid and a BlackBerry Bold! 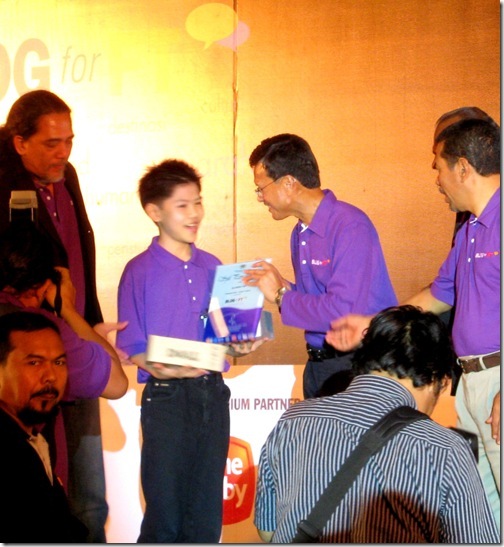 Sonny Ikmal Bin Ahmad Kamil was the 1st runner-up, for his entry Pasar Chow Kit, Pasar Satu Malaysia! 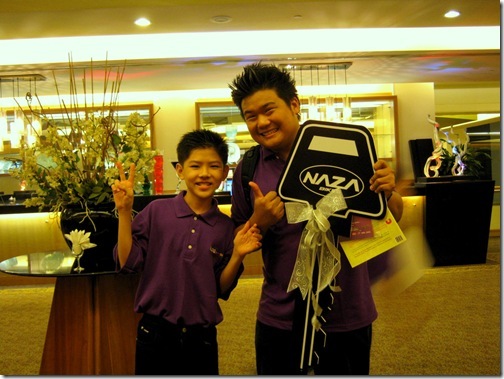 He won a Naza Prisma Motorbike, a Dell Studio Hybrid, and a MacBook (I’ve always wanted one)! Woohoo! 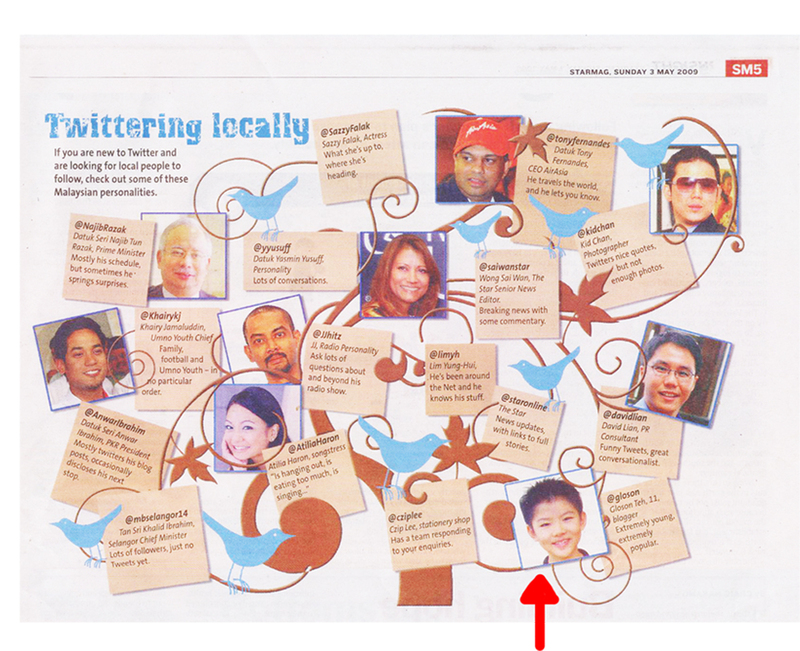 My friend, Niki Cheong, who featured me as a twitterer in the press last year, was the Grand prize winner! 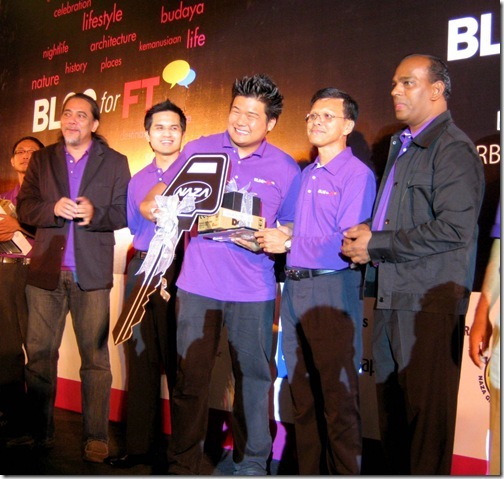 He won a Kia Optima Novus car, for his entry My Bangsar! Congratulations Niki (The guy in the hat)! After that, the winners of the Public category were announced. Loke Seng Hon was the 2nd runner-up, for his entry, History, Heritage & Architecture – All in KL & Putrajaya. 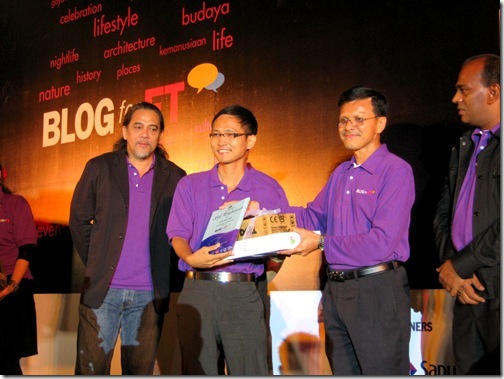 He won a Dell Studio Hybrid and a BlackBerry Bold! Nigel Sia was the 1st runner-up for his post, Thankful (A video that has great reasons why Malaysians should be thankful). It was later projected on the screen for everyone to watch as they finish their meal. He won a Naza Prisma motorbike, a Dell Studio Hybrid and a Macbook! As he was receiving the “key”, I could hear many of his friends cheering him! Go Nigel (Center)! 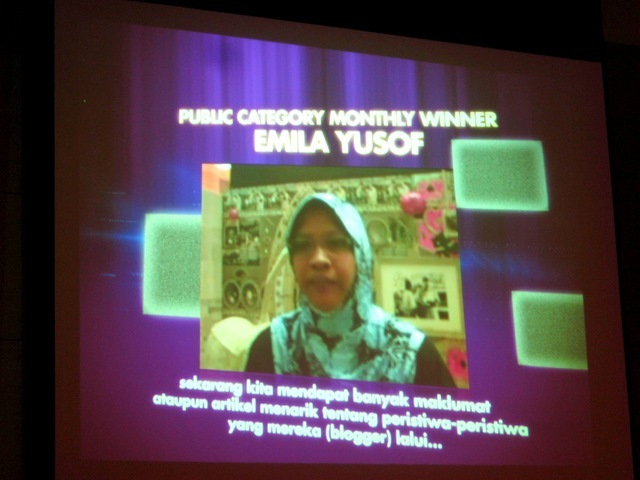 Emila Yusof is the grand prize winner for her entry, KL: A to Z Fun Things to do & Places to Visit with kids, a unique, colorful and fun flipbook filled with drawings she drawn herself! She won a Peugeot 308 VTi car! Woohoo! Unfortunately, she was not able to come to the ceremony as she was flying back from Italy. So, her husband and her cute little boy came to represent her. 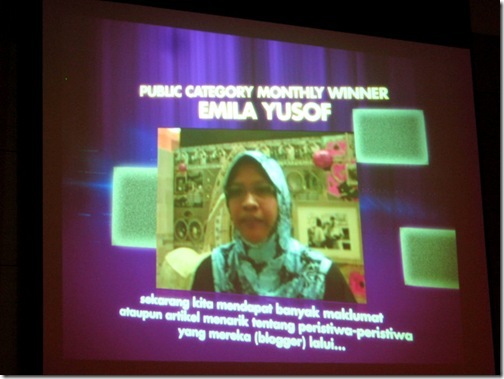 Emila Yusof was interviewed by Blog4FT and it was featured on the screen as dinner was served. You should really go see Emila’s drawings in the flipbook. They’re truly amazing! She has also blogged about her prize on her blog. Winners posing on the stage. 1Malaysia! Me with the grand prize winner of the Media category, Niki Cheong. 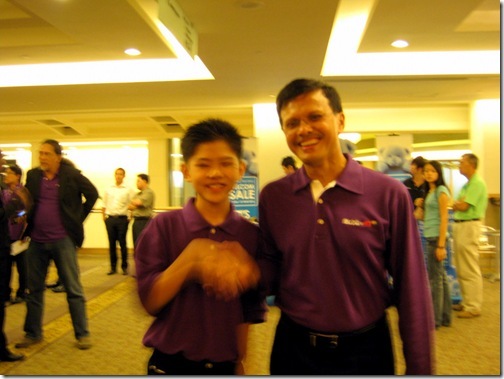 Me with Nigel Sia, 1st runner-up in the Public category. Shaking hands with Datuk Raja Nong Chik. 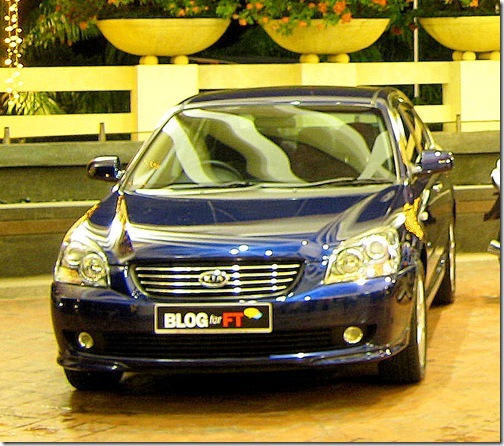 Outside, the winners were posing with their brand new shiny vehicles! Here’s Niki Cheong with his brand new shiny Kia Optima Novus! What a shiny and beautiful car! Niki has also blogged about his winnings on his blog. 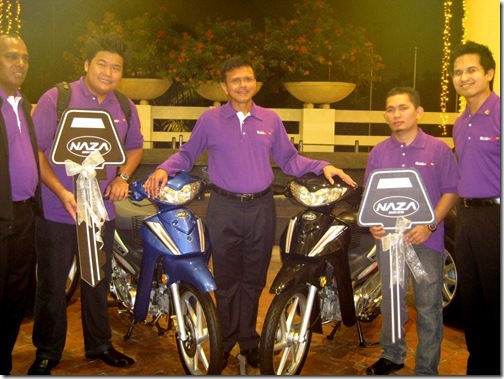 Nigel Sia (right) from the Public category posing with his Naza Prisma motorbike (He blogged about this on his blog). 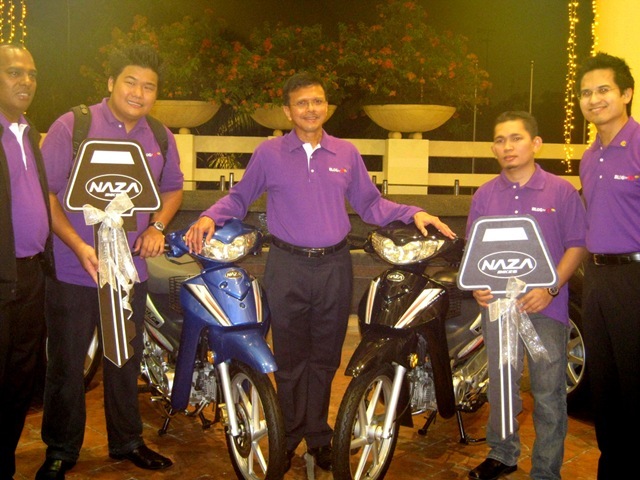 On the left is Sonny Ikmal Bin Ahmad Kamil (Media category) with his motorbike. Datuk Raja Nong Chik posed stylishly in the middle . Here’s Yassin, the son of Emila Yusof, the grand prize winner from the Public category posing with his mom’s brand new car. Picture taken from her blog post about her winnings. Wow! It’s a shiny brand new silver car! Us posing together before we went back home. 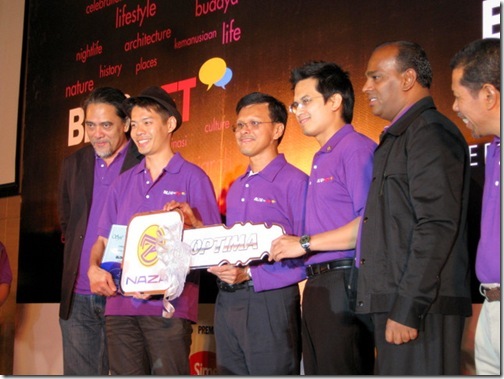 From left to right: Datuk Rocky (The Chief Judge), Yeow Minyi, Nigel Sia, Niki Cheong, and me. 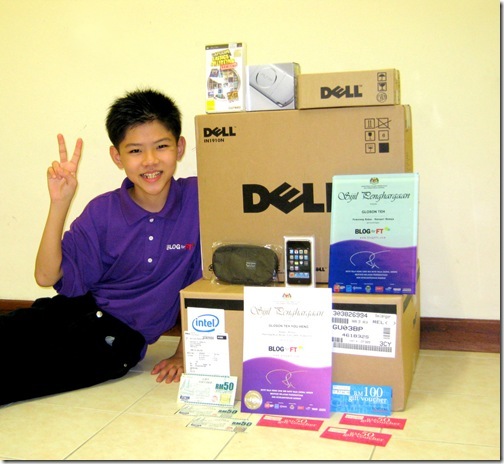 Me posing with the prizes when I reached home. From up to down, Sony PSP, Dell Studio Hybrid, iPod touch, Medal of being the 1st runner-up, certificate for being a December month winner, and Isetan and Borders vouchers. Once again, I want to say a big thank you to you guys for supporting me and voting for me, and for being a reader of my blog. I couldn’t have made it without you!